There are more than 50 kinds of sarcoma. Each kind is rare, yet all together sarcomas affect hundreds of thousands of people around the world. The Liddy Shriver Sarcoma Initiative has announced the funding of a $50,000 grant for promising osteosarcoma research by investigators at Case Western Reserve University (CSRW) and the National Institutes of Health. In the study, Peter Scacheri, PhD; Chand Khanna, DVM, PhD and James Morrow will bring a new set of tools and perspectives to the problem of osteosarcoma metastasis, or tumor spread. The team of researchers hope, for the first time, to determine what genes and proteins are truly responsible for osteosarcoma metastasis. Osteosarcomas tend to spread to the lungs, and that spread is a great threat to the lives of patients. Thus, according to Dr. Khanna, "This study is designed to improve our understanding of how and why osteosarcoma cells are able to spread so effectively from the site of the primary tumor to other parts of the body." Dr. Scacheri explains: "The spread of disease is mediated by genes that have gone awry in the primary tumor cells. However, the identity of the responsible genes are not known, and current therapies designed to nonspecifically kill rapidly dividing cells are only moderately successful and have substantial side effects." The investigators also hope that this study will help doctors to identify patients who are at higher risk of developing metastatic osteosarcoma. Currently, there is no way to predict which patients are more likely to experience metastasis and consequently require aggressive or experimental therapies. If scientists can identify the genes responsible for metastatic osteosarcoma, those genes will serve as valuable biomarkers for predicting metastatic disease in patients and should be excellent drug targets for therapeutic interventions. The prevailing model of metastasis posits that a small number of cells within the primary tumor acquire additional genetic mutations, equipping them with the ability to metastasize. In other words, metastatic cells are genetically selected from the pool of cells in the primary tumor in a process that is distinct from tumorigenesis. However, this model is not well supported by recent whole genome sequence studies, which have revealed little-to-no differences between the mutational landscape of matched primary and metastatic tumor pairs. 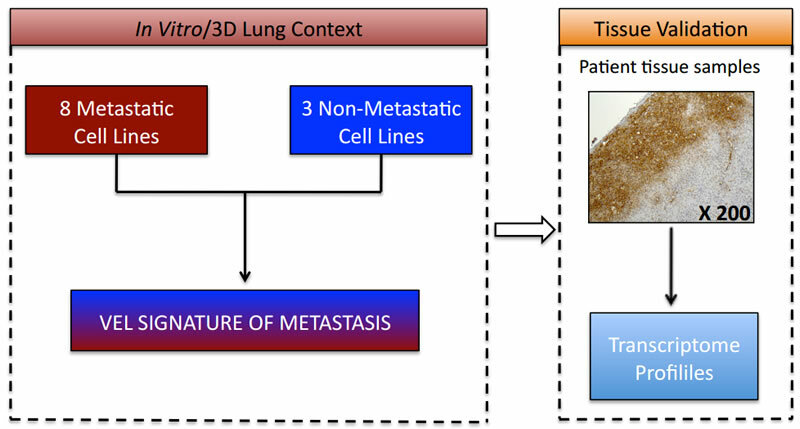 Our proposal tests a new paradigm to explain the molecular basis of metastasis. Specifically, we hypothesize that the basis of metastasis is epigenetic, i.e., defined at the level of the epigenome. If the basis of metastasis is indeed epigenetic, this opens the door for novel therapeutic approaches that are focused on targeting the epigenetically altered genes, or the epigenome in general. 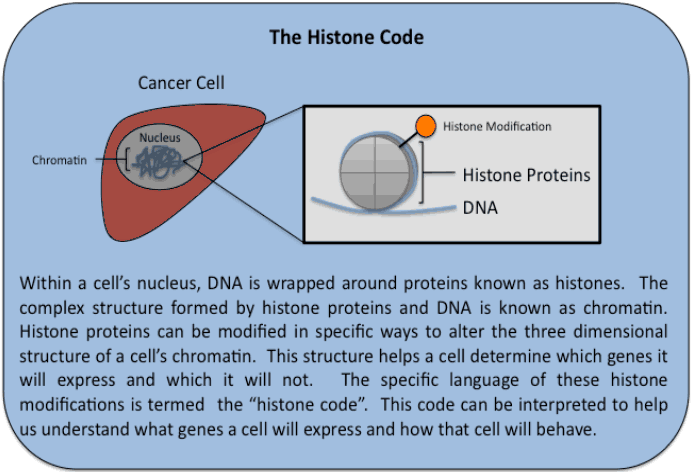 The field is currently making strides in developing compounds that target the various regulators of the histone code. If the proposed studies support the epigenetic hypothesis, we can tap into this growing area of therapeutic research and its application to osteosarcoma and potentially even other childhood cancers. Additionally, if the epigenetic hypothesis proves to be valid, our studies should reveal the identity of genes that are prognostic biomarkers for metastatic disease. These biomarkers would allow for prospective stratification of patients based on metastatic risk. This would improve patient outcomes by preventing administration of agents with high toxicity profiles to patients who don't require them and ensuring that only high-risk patients receive aggressive or experimental treatments. 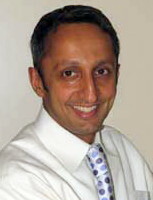 This proposal combines the expertise of two independent laboratories (Dr. Peter C. Scacheri, CWRU, and Dr. Chand Khanna, NCI) with unique skill sets and demonstrated track records of success. Dr. Khanna is a leader in the field of osteosarcoma and has developed a human cell line panel and a number of novel mouse models to rigorously study the biology of tumor metastasis. The Scacheri lab is renowned in epigenetics and the study of the role of the histone code in health and human disease. This interdisciplinary team will work closely together. The successful completion of the study will open up new opportunities for the development of drugs that directly target the responsible genes and block the process of metastasis, offering significant improvements on currently used treatments. In the era of targeted and biologically based drug development the role of cancer specific (i.e. osteosarcoma specific) research is essential. It is only through the study of sarcoma cells and tissues that an understanding of this cancer, and from our standpoint its ability to spread to other parts of the body, will be realized. An essential point to consider as one looks at the value of sarcoma-specific research is that the vast majority of cancer research is currently conducted in cancers that derive from epithelial tissues. Since the cell of origin in sarcomas is the mesenchymal cell, it is absolutely necessary that studies be conducted in a cancer-specific context. This $50,000 grant is funded, in part, by a generous donation of $20,000 from the Alan B. Slifka Foundation, and by donations totaling $30,000 from several wonderful donors to the Liddy Shriver Sarcoma Initiative. The Alan B. Slifka Foundation is a private grant-making foundation that is dedicated to making a world safe for difference and healing. The Initiative acknowledges generous donations from Katelyn Andresen and the friends and family of Hallie Brown, Nathan Burgess and Alyssa Divers, all of whom lost their lives to osteosarcoma and in honor of Bailey Moody, whose post treatment scans reveal no evidence of disease. We also thank Brandon’s Defense Foundation (in Memory of Brandon Gordon), Fishin’ For The Cure (in memory of Matthew Siegle) and Sarah’s Garden of Hope (in memory of Sarah Pidgeon) for their continued support in helping fund osteosarcoma research. Together, we are making a difference. Peter C. Scacheri, PhD: Since my first position in genetics, I have worked on childhood onset genetic disorders, and I've been investigating the molecular basis of cancer for over a decade. My work on cancer began as a post-doctoral fellow at the National Institutes of Health, where I investigated the molecular underpinnings of endocrine tumor formation using mouse models and genomics. Upon establishing my own lab in 2006 within the School of Medicine at Case Western Reserve University, I have focused on genetic and epigenetic studies of cancer and also a genetic disorder of development (CHARGE syndrome). This research has led us to discover that human diseases, including cancer, are a manifestation of gene expression gone awry as a result of changes at the chromatin level (epigenetics). This exciting new field of epigenetics has tremendous potential to have a broad impact on our understanding and treatment of childhood cancer. My studies on osteosarcoma are driven by a strong interest in understanding the mechanisms underlying this aggressive cancer in the hope that this will lead to novel, effective, and less toxic therapies for patients. I will serve as co-Principal Investigator of the project. Together with Dr. Khanna from the NCI, I will be responsible for the management of the project, its direction and conduct, and reporting all findings to the public. Chand Khanna, DVM, PhD: I have been working in the field of sarcoma metastasis for over 15 years and have been consistently motivated by the need for improved treatment options. Sadly the options for the treatment of osteosarcoma patients that existed when I started my career are the same ones that are used today. There has been no improvement in the long-term outcome for patients in over 25 years. My role in this project will be to use and develop relevant assay models of metastatic progression that will be the source of biological materials for studies of gene expression and enhancer activity. These systems will be used in biological validations of the results from this study and to coordinate validation in human tissues from patients with osteosarcoma. Note: Dr. Khanna is an active collaborator on this grant, but that none of the grant funds will be provided to his program at the National Cancer Institute. V10N3 ESUN Copyright © 2013 Liddy Shriver Sarcoma Initiative. Epigenomics is an emerging field of biology that is allowing for unprecedented insights into the molecular underpinnings of myriad normal biological processes and disease states. Recent studies by our group and others have shown that changes in the cancer epigenome are essential for the development and progression of the malignant phenotype.1,2 In the studies described below, we propose to take an epigenomic approach to defining and understanding the molecular drivers of metastasis in osteosarcoma. These studies have the potential not only to enhance our understanding of the biology of osteosarcoma, but also to improve outcomes for patients afflicted with this aggressive form of cancer. Understanding the molecular basis of metastasis is therefore important to improving outcomes for pediatric osteosarcoma patients. The primary goal of our study is to identify the key genes responsible for metastasis with the hope of developing novel therapeutic approaches that will substantially improve patient outcomes. 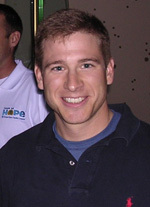 It is well documented that gene enhancer activity is a primary determinant of many cellular phenotypes and that this activity is dictated by epigenetic histone marks (H3K4me1 and H3K27ac) in enhancer regions of the genome.8 Specifically, the presence or absence of these marks determine whether an enhancer is ‘inactive’, ‘poised’, or ‘active’ (Figure 1).9 Moreover, we recently published a paper in Science showing that by identifying gains and losses of enhancer-histone marks across the cancer epigenome, one can pinpoint genes that are commonly targeted for disruption in cancer and thereby define the cancer phenotype.1 Our data demonstrate that the enhancer-profiling strategy for defining cellular phenotypes in cancer is far more powerful than alternative approaches that only survey the tumor transcriptome or tumor methylome. The goal of this project is to implement epigenomic enhancer profiling to identify the key genes that mediate the metastatic phenotype in osteosarcoma, an approach that has the potential to significantly impact patient care by elucidating novel anti-metastatic drug targets and developing a predictive signature of progressive disease. We hypothesize that osteosarcoma cells harbor an epigenetic enhancer profile that defines and predicts their metastatic phenotype. As a first step to test this hypothesis, we used chromatin immunoprecipitation with massively parallel sequencing (ChIP-seq) to map the genome-wide distribution of H3K4me1-marked gene enhancer elements in a metastatic and non-metastatic osteosarcoma cell line pair. Remarkably, these clonally derived lines display epigenetic differences at thousands of enhancer elements, which we term metastatic variant enhancer loci or Met VELs, despite being relatively similar at the level of the transcriptome (Figure 2). These seemingly disparate findings suggest that epigenetic enhancer marks are a determinant of gene expression patterns that dictate the metastatic phenotype after tumor cells arrive at the secondary microenviroment of the lung. Our experimental approach will allow us to identify the genes expressed by metastatic osteosarcoma cells within the lung and assess the contribution of the enhancer epigenome to the metastatic phenotype. We propose to investigate the role of enhancer epigenome in driving and predicting metastasis in pediatric osteosarcoma through the completion of the Specific Aims outlined below. 1. Test whether metastatic-specific enhancers drive gene expression patterns of osteosarcoma cells within the lung microenvironment. We have defined thousands of differences in the enhancer profiles of a metastatic and non-metastatic pair of osteosarcoma cell lines by H3K4me1 ChIP-seq (Figure 2). We hypothesize that these profiles predict gene expression within the metastatic microenvironment. We propose to test this hypothesis using a novel pulmonary model of metastasis (PuMA) developed by our group (Figure 3).10 Specifically, we will sort fluorescently labeled tumor cells out of the PuMA system and assess global gene expression by RNA sequencing (RNA-seq). Using this data, we will determine whether the enhancer epigenome is predictive of metastatic gene expression within the lung microenvironment. Based on the developing perspective that phenotype-specific gene expression is driven by enhancer activity and our past studies demonstrating our ability to define cancer-specific genes in colorectal carcinoma, we expect that enhancer profiles defined by H3K4me1 marks will be predictive of gene expression in the metastatic microenvironment. Our approach will allow for the identification of epigenetically regulated genes that determine metastatic success, potentially providing novel therapeutic targets. 2. Test whether metastatic osteosarcoma cells share a common set of enhancers that typify the metastatic phenotype. We hypothesize that metastatic osteosarcoma cells share a set of poised enhancers (Met VELs) that are distinct from non-metastatic osteosarcoma cells and that these enhancers define and predict the cells’ metastatic potential. We plan to test this hypothesis using a panel metastatic and non-metastatic pairs of osteosarcoma cells developed by our group and others. We will generate H3K4me1 ChIP-seq profiles and PuMA RNA-seq expression profiles for a total of 8 metastatic human osteosarcoma cell lines and the 3 non-metastatic cell lines from which they were derived (Figure 4). Identification of Met VELs in each of our 8 metastatic cell lines. Validation of these enhancer marks as drivers of metastatic gene expression programs within the lung microenvironment. Assessment of heterogeneity in metastatic enhancer profiles and gene expression programs across metastatic cell lines. We predict that these studies will elucidate a common epigenomic enhancer signature of metastasis. However, if we should discover that the epigenomic enhancer profiles and metastatic gene expression programs are heterogeneous across our cell line panel, our findings would still provide novel insight to the mechanism of metastasis in pediatric osteosarcoma and inform future studies aimed at developing anti-metastatic agents. 3. Test the predictive power of our ‘metastatic signature’ using available gene expression data from over 200 clinical specimens. Are genes poised or actively expressed in our models similarly expressed in human tissue? Are expression profiles in metastases more similar to the identified metastatic signature than those in primary tumors? Can we predict risk for metastatic progression by correlating primary tumor expression profiles to our defined metastatic signature? 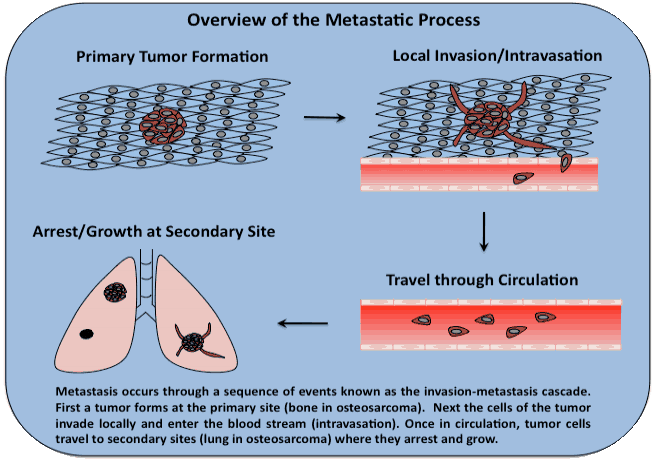 The successful completion of these Aims will provide insight into the mechanisms of metastasis in osteosarcoma and potentially allow one to predict the metastatic behavior of a given patient’s cancer. 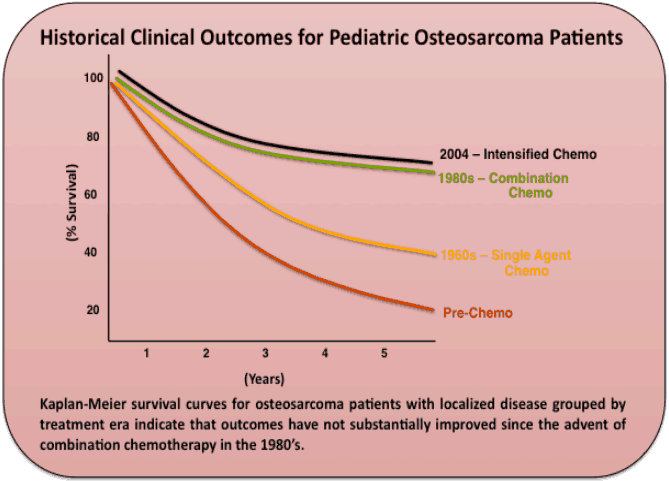 This information has the potential to shift the paradigm of osteosarcoma treatment, allowing for prospective stratification of patients based on metastatic risk and opening new therapeutic avenues. Results from these studies will be rapidly translated into the clinic. Specifically, new understanding of expression programs driving metastasis in osteosarcoma will allow for preclinical (i.e. in vivo mouse studies) and clinical testing of compounds that inhibit the cellular processes dictated by these expression programs, moving the field closer to curative approaches for patients that do not respond to the current standard of care. Additionally, the development of a predictive metastatic signature would allow for the design of clinical trials to validate this signature in patients. This validation offers the potential for the development of a new clinical tool that pediatric oncologists could use to prospectively stratify their patients at the time of presentation based on risk of metastatic progression and could potentially be used as inclusion criteria for clinical trials of anti-metastatic agents. 1. Akhtar-Zaidi B C-S-lR, Corradin O, Saiakhova A, Bartels CF, Balasubramanian D, Myeroff L, Lutterbaugh J, Jarrar A, Kalady MF, Willis J, Moore JH, Tesar PJ, Laframboise T, Markowitz S, Lupien M, Scacheri PC. Epigenomic enhancer profiling defines a signature of colon cancer. Science 2012;336(6082):736-9. 2. Hansen KD, Timp W, Bravo HC, Sabunciyan S, Langmead B, McDonald OG, et al. Increased methylation variation in epigenetic domains across cancer types. Nat Genet 2011;43(8):768-75. 3. Geller DS, Gorlick R. Osteosarcoma: a review of diagnosis, management, and treatment strategies. Clin Adv Hematol Oncol 2010;8(10):705-18. 4. Valastyan S, Weinberg RA. Tumor metastasis: molecular insights and evolving paradigms. Cell 2011;147(2):275-92. 5. Campbell PJ, Yachida S, Mudie LJ, Stephens PJ, Pleasance ED, Stebbings LA, et al. The patterns and dynamics of genomic instability in metastatic pancreatic cancer. Nature 2010;467(7319):1109-13. 6. Jones S, Chen WD, Parmigiani G, Diehl F, Beerenwinkel N, Antal T, et al. Comparative lesion sequencing provides insights into tumor evolution. Proc Natl Acad Sci U S A 2008;105(11):4283-8. 7. Yachida S, Jones S, Bozic I, Antal T, Leary R, Fu B, et al. Distant metastasis occurs late during the genetic evolution of pancreatic cancer. Nature 2010;467(7319):1114-7. 8. Heintzman ND HG, Hawkins RD, Kheradpour P, Stark A, Harp LF, Ye Z, Lee LK, Stuart RK, Ching CW, Ching KA, Antosiewicz-Bourget JE, Liu H, Zhang X, Green RD, Lobanenkov VV, Stewart R, Thomson JA, Crawford GE, Kellis M, Ren B. Histone modifications at human enhancers reflect global cell-type-specific gene expression. Nature 2009;459(7243):108-12. 9. Zentner G SP. The Chromatin Fingerprint of Gene Enhancer Elements. The Journal of Biological Chemistry 2012;287(37). 10. Mendoza A HS, Osborne T, Khan MA, Campbell K, Briggs J, Eleswarapu A, Buquo L, Ren L, Hewitt SM, Dakir el H, Garfield S, Walker R, Merlino G, Green JE, Hunter KW, Wakefield LM, Khanna C. Modeling metastasis biology and therapy in real time in the mouse lung. J Clin Invest 2010;120(8):2979-88. 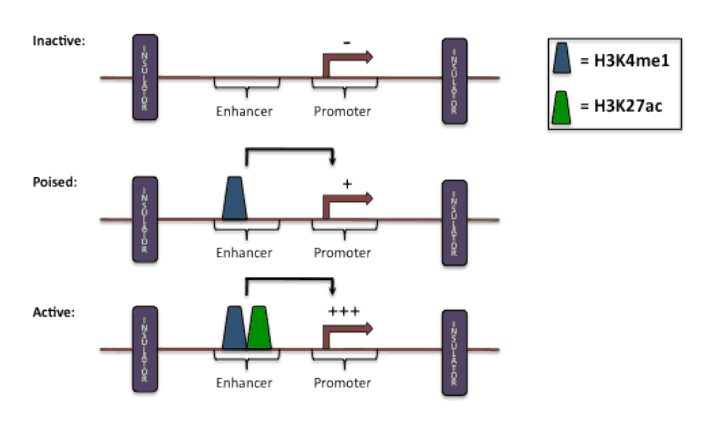 Enhancer activity is broadly dictated through specific histone modifications. Monomethylation of the 4th lysine of histone 3 (H3K4me1) defines a ‘poised’ enhancer. Concurrent acetylation of the 27th lysine of histone 3 (H3K27ac) confers the ‘active’ state to an enhancer. (A) Scatter plot of log2 transformed global gene expression values from Affymetrix U133 plus 2.0 microarrays of one representative pair of human osteosarcoma cell lines with different metastatic potentials shows strong concordance in gene expression between cell lines. (B) Scatter plot of all H3K4me1-marked enhancer ChIP-seq peaks from one representative pair of human osteosarcoma cell lines with different metastatic potentials show divergence in enhance profiles between cell lines. (C) Representative genome browser view showing differences in H3K4me1-marked enhancers between one metastatic and non-metastatic cell line pair. We term these regions metastatic variant enhancer loci, or Met VELs. (A) GFP-labled tumor cells from culture are seeded to lung via tail vein injection. (B) Lungs are insuflated with media/agarose solution via gravity perfusion to maintain 3D architecture. (C) Lungs are extracted, cooled, and sectioned for culture. (D) Lung sections are grown ex vivo at air-fluid interface to maintain the lung microenvironment. 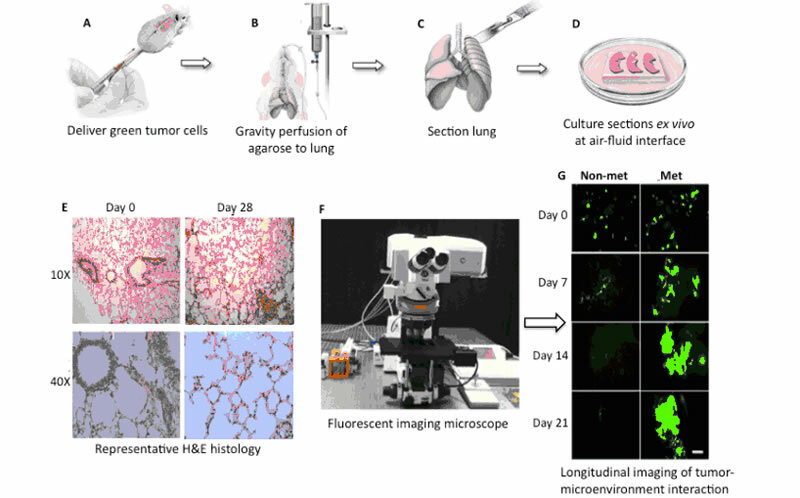 (E) Representative H&E sections at low (10X) and high (40X) magnification show interaction of metastatic lesions with intact lung microenvironment over 28 days in culture. (F) Sections are imaged longitudinally using fluorescent imaging microscope. (G) Representative fluorescent images show success of metastatic (Met) osteosarcoma cells within lung microenvironment and failure of non-metastatic (Non-met) cells over 21 days in ex vivo culture. Non-metastatic osteosarcoma cell lines established from patient tumors were used to derive metastatic cell lines to generate a panel of metastatic and non-metastatic human osteosarcoma cell lines suitable for investigation of the metastatic phenotype (3 non-metastatic lines and 8 metastatic lines). Through our proposed ChIP-seq and RNA-seq experiments, we will use this panel to assess the presence of an epigenomic enhancer signature of metastasis in osteosarcoma. We will first generate H3K4me1 ChIP-seq data to characterize the enhancer epigenome of each cell line. We will then obtain metastatic gene expression profiles from each cell line by sorting fluorescently labeled cells out of our PuMA system and performing downstream RNA-seq. We will interrogate these data sets to determine the concordance between enhancer profiles and metastatic gene expression across lines and to assess the level of heterogeneity in these profiles within our cell line panel. We predict detection of a common epigenomic signature of metastasis present in our metastatic cell lines. Enhancer and expression profiles from 8 metastatic and 3 non-metastatic lines will be used to generate a VEL signature of metastasis. The validity of these findings will be tested using expression data from >200 human osteosarcoma tissue samples linked to clinical outcome.